We've seen it many times before-combining two different technologies into one device. Remember when MP3 players just played music and had no other functions? Nowadays, these players are able to play music, video, display photos, record messages, and view documents. So, it was only natural for digital cameras and GPS technology to intertwine. It makes a lot of sense to integrate GPS into a digital camera, because it allows you to put an exact location with each photo. This can be very useful for old vacation photos, for instance, where you may have forgotten where a particular photo was taken. Much like today's digital cameras place a "time stamp" on each photo, with GPS capabilities they would be able to place a "location stamp " with each photo. This location stamp is also referred to as "geotagging". 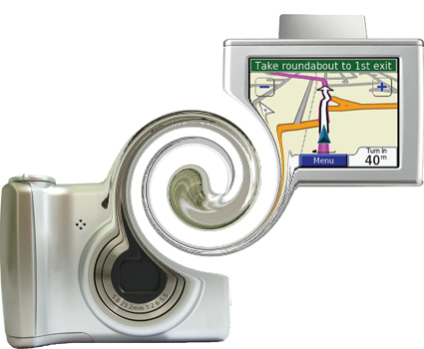 Combining GPS with a digital camera is a relatively new technology that won't be on the market until sometime in 2008 according to Kanwar Chadha, founder of GPS chip designer Sirf Technology. He says that "most (camera makers) are seriously planning location-enabled cameras... (the first) you'll see next year". An immediate concern of geotagging is the privacy concerns associated with photos placed on a photo-sharing website like Flickr or MySpace. People would be able to view the location that each photo was taken at, which may end up violating the privacy of people who don't want that information revealed. People would definitely have to be weary about the photos that they placed on the Internet. Integrating GPS with a digital camera is proving to be easier said then done. One reason for this is that GPS devices are traditionally "battery-hungry" devices, which could pose a problem when trying to combine it with a digital camera. Another potential problem associated with the marriage of a digital camera and a GPS device is that a digital camera will automatically power off when not in use, while a GPS device typically takes up to a few minutes to "find a fix" after it has been turned on. This would mean that you would have to wait for the GPS to find a fix before you could make use of the geotagging feature, and that means no photos until the GPS is ready. Chadha described a way around this problem, which involves the use a new GPS chip that can get a fix within 10 seconds. Still, most people don't want to wait 10 seconds to snap a photo, so this problem will have to be improved upon in order for the GPS-enabled digital camera to be practical. There are a few DSLR cameras out there that offer a GPS module add-on, such as a high-end model manufactured by Ricoh. Obviously, this technology has some kinks to work out before it hits the consumer market, but I welcome the digital camera and GPS partnership with open arms. Deliver That P2P Business Connects You With Products You Can’t Find!